Kong: Skull Island was a visual marvel, its aesthetic magnificence helping to distract from its uneven tone, lack of clear protagonist, and complete trivialization of ostensible stars Tom Hiddleston and Brie Larson. There might be no greater, more iconic shot this year than the first glimpses we get of King Kong cast in the glare of a hazy sun. A new video from Wired works to provide some insight into the process behind the film’s visual effects, with host Mike Seymour pinpointing a few specific scenes that provided unique challenges. 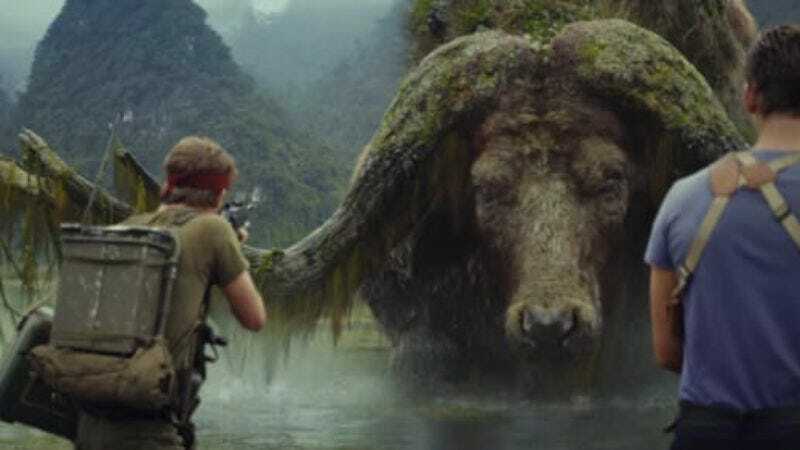 What’s especially interesting is that the noted scenes, which include Kong’s consumption of a giant squid and the appearance of a massive, seaweed-soaked water buffalo, were essentially a means of world-building rather than any kind of centerpiece action sequence. The squid scene, for example, encompassed everything from flesh and water sims to facial animation and “complex fur grooming.” Fur, it appears, was a central component to many of the film’s effects, as Kong’s avatar was sheathed in 19 million individual hairs. A few bits of trivia round out the proceedings, the most amusing being in how the film’s monstrous villains—the reptilian skullcrawlers—were inspired by none other than Pokémon’s skull-clad Cubone. Or maybe it was its internal organs?